A figure is a photo, image, map, graph, or chart inserted into your research paper. A table is a table of information inserted into your research paper. For more information on citing figures and tables in MLA, see Purdue OWL. If the image appears in your paper and the full citation appears in the caption, it does not need to be included in the Works Cited List. If the full caption is not included in the figure's caption, include an entry in the Works Cited List. If you are referring to an image but not including it in your paper, you must provide an in-text citation and include an entry in the Works Cited List. If you have trouble finding specific information about an image, cite the entire book, magazine article, web site, etc. where you found it. For example if information came from a table in an article in National Geographic magazine, you would cite the entire magazine article and add the relevant page number to the caption or in-text citation. The word figure should be abbreviated to Fig. Each figure should be assigned a figure number, starting with number 1 for the first figure used in the assignment. For example, Fig. 1. Images may not have a set title. If this is the case give a description of the image where you would normally put the title. Do not italicize or put this description in quotes. Need help captioning or citing images outside of the academic context? Check out Fair Use: Using Images for information on how to caption someone else's image on your own website. "Title" by A. 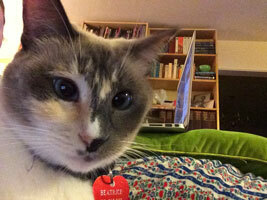 Creator, via source (photo attribution). "Mt. Fuji" by Yayoi Kusama, via Art + Auction vol. 34, no. 4, Nov. 2010. Skirt by Annakiki, via WGSN. "Angel's Flight" by Millard Sheets, via LACMA. Beatrice Took a Photo! by mstornadox, via Tumblr. Six Apple logos from 1976 to now, via Rob Janoff (© RobJanoff 2012). Man stretching, via Sports Digest, 8 May 2006. Zaha Hadid's notebooks, via "Zaha Hadid" (photo Luke Hayes). Creator's Last Name, First Name. "Title of Image." Title of Journal, vol. Volume Number, Publisher Name, Date of Publication, pp. First Page - Last Page. Name of Database. For captions, use: Fig. #. Description of figure: from Citation. Kusama, Yayoi. "Mt. Fuji (QPWE) [Art Reproduction]." Art + Auction, vol. 34, no. 4, Nov. 2010, p. 46. Art & Architecture Source. Fig. 1. "Mt. 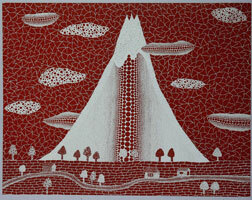 Fuji" by Yayoi Kusama from: Art + Auction, vol. 34, no. 4, Nov. 2010, p. 46. Art & Architecture Source. Creator or Company or Brand. Short Description from "Title of Report." Report by Author's First Name Last Name, Date of Publication. WGSN. Annakiki. Skirt. "Short Skirt S/S 15 China Womenswear Commercial Update." 4 June 2016. WGSN. Note: If there is no formal title, add a description without quotes or italization. Fig. 2. Skirt by Annakiki from: "Short Skirt S/S 15 China Womenswear Commercial Update," 4 June 2016. WGSN. Work of Art in a Museum, Gallery, etc. Creator's Last Name, First Name. Title of Work. Date of Composition or Publication, Medium, Repository, City. For captions, use: Fig. #. Title by artist, Citation. Sheets, Millard. Angel's Flight. 1931, oil on canvas, Los Angeles Country Museum of Art. Note: The city name was omitted since it appears in the repository name. Fig. 3. 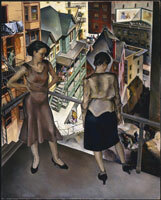 Angel's Flight by Millard Sheets, 1931, oil on canvas, Los Angeles Country Museum of Art. Reproduction of a Work of Art in a Museum, Gallery, etc. If you are discussing a specific reproduction or version of a work of art, add information about where you found the image. Creator's Last Name, First Name. Title of Work. Date of Composition or Publication, Medium, Repository, City. Title of Book or Web Site, Edition information, Contributors, Publisher, p. Page Number, URL. Accessed Date. For captions, use: Fig. #. Description of figure: Citation. Sheets, Millard. Angel's Flight. 1931, oil on canvas, Los Angeles Country Museum of Art. LACMA, collections.lacma.org/node/225837. Accessed 9 Nov. 2017. Sheets, Millard. Angel's Flight. 1931, oil on canvas, Los Angeles Country Museum of Art. Painting and Sculpture in Los Angeles, 1900-1945, by Nancy Moure, LACMA, p.56. Sheets, Millard. Angel's Flight. 1931, oil on canvas, Los Angeles Country Museum of Art. Flickr, photo by Randall Hobbet (Lightbender), 8 June 2014, www.flickr.com/photos/rdhobbet/14538537296. Accessed 9 Nov. 2017. Note: When possible, use the real name with the username in parentheses. Fig. 3. Angel's Flight by Millard Sheets: 1931, oil on canvas, Los Angeles Country Museum of Art, collections.lacma.org/node/225837. Accessed 9 Nov. 2017. Fig. 3. Angel's Flight by Millard Sheets: 1931, oil on canvas, Los Angeles Country Museum of Art. Painting and Sculpture in Los Angeles, 1900-1945, by Nancy Moure, LACMA, p.56. Fig. 3. Angel's Flight by Millard Sheets: 1931, oil on canvas, Los Angeles Country Museum of Art. Flickr, photo by Randall Hobbet (Lightbender), 8 June 2014, www.flickr.com/photos/rdhobbet/14538537296. Accessed 9 Nov. 2017. Articles: Author's Last Name, First Name. "Title of Article." Title of Journal, Other Contributors, Version, Number, Publisher, Date of Publication, p. Page Numbers. Books: Author's Last Name, First Name. Title of Book, Edition, Publisher, Year of Publication. Green, Annie. "Yoga: Stretching Out." Sports Digest, 8 May 2006, p. 22. Fig. 6. Man exercising from: Green, Annie. "Yoga: Stretching Out." Sports Digest, 8 May 2006, p. 22. If you are citing an image from a source already included on your Works Cited list, you do not need to list it again. Instead, use the appropriate in-text citation and add the specific page number, when available. For captions, use: Fig. #. Description (Author's Last Name Page Number) or ("Title of Article" Page Number). Martin, Colin. "Zaha Hadid: "... No End to Experimentation." Architecture New Zealand, no. 2, Mar/Apr2017, pp. 88-92. Art & Architecture Source. Fig. 7. Zaha Hadid's notebooks (Martin 91). Mohr, Andrea. "Family Variables Associated With Peer Victimization." Swiss Journal of Psychology, vol. 65, no. 2, 2006, pp. 107-116, Psychology Collection, doi: http://dx.doi.org/10.1024/1421-0185.65.2.107. Note: If the full citation is included in the source caption, you do not need to add it to the Works Cited list.